I was born in Brighton England in 1958. My father, Raymond Calloway, was a commercial artist, and my mother Betty Diana, an artist too, In 1960, the family moved to Steyning, where I attended St. Andrews Primary and later Steyning Grammar School. Influenced by my parents’ artistic lifestyle and progressive attitude, I gained a thorough grounding in painting and draftsmanship. 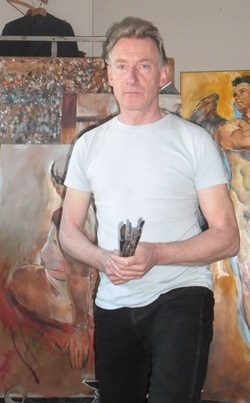 In 1976 I was admitted to Canterbury College of Art, majoring in Painting. I graduated in 1979, gaining a B,A, in Art and Art History. The next 5 years, after moving to London, I divided my time between painting, earning a living and playing the guitar. In 1986 I began a journey across Europe and Asia, last stop being New Zealand, where I finally settled in Hamilton and worked as a photo lithographer and designer. However, in 1991 , I decided to Iconcentrate entirely on my artistic endeavours and paint full time. My first exhibition in New Zealand was a group show in 1994 in Hamilton, followed by many personal exhibitions in Hamilton, Auckland, Raglan, Morrinsville, Cambridge and Whitianga. In 2006, my association with Waikato Society of Art lead to tutoring position in Oil painting and life drawing. I currently live with my wife , sculptor Brigitte Calloway, in Inglewood, New Plymouth, where I work from my studio titled “Steyning”, in reverence to my English beginnings.